Sonoma State University president Judy Sakaki gave the keynote address at the Nikkei Angel Island Pilgrimage at Angel Island State Park on October 13, 2018, organized by the Nichi Bei Foundation in partnership with AIISF, the California Genealogical Society, and the National Japanese American Historical Society. 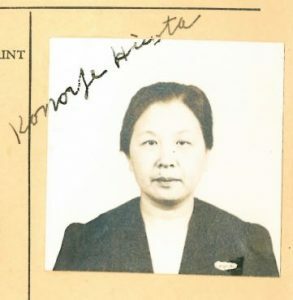 Following are remarks about her immigrant grandmothers from Japan. I’m so honored to speak today. Thank you Rosalyn, thank you to the Nichi Bei Foundation and thank you to all the members of the planning committee. Thank you for bringing us together for this Nikkei Pilgrimage. It is a true gift to have this day together to remember our roots and to honor our ancestors. This island … Angel Island…. It’s where many of our ancestors first stepped into a new country … into a new way of life … and into a new world. And, because they did…many of us are here. 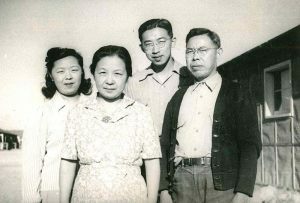 For many JA’s or Japanese Americans, Angel Island marks the start of the experience of our family in the United States. Irrespective of where we were born, where we grew up, where we went to school or where we now work….many of us are connected by the shared Angel Island experience of our grandparents, great grandparents or ancestors. I was born and grew up in Oakland. As a young girl, I attended Japanese School on Saturdays and Sunday School at the Buddhist temple. In college, I enrolled in Japanese language classes and then in search of my roots, I decided to spend a summer in Japan. I took classes at Sophia University in Tokyo, and for the first time, I met cousins, aunts, uncles and other relatives in Fukuoka. I was an undergraduate searching for my roots and discovered so much. I learned ‘Gaman’ enduring the seemingly unbearable with patience and dignity. ‘Gambatte’ – “fight for it, do your best”. I learned much from strong and caring women, my mother and my grandmothers. My maternal bachan, Konoye Hirota, arrived here in 1917. My paternal bachan, Shigeru Sakaki, arrived here in 1918 … exactly 100 years ago. Both of my grandmothers were picture brides. After arriving here at Angel Island, my grandmothers married my grandfathers … men they did not know, and whom they had never met. Over the years, I have shared my grandmothers’ stories in speeches … and in talks with students. … to hear … to understand … and to celebrate the stories of our ancestors.. and of the heritages that make up our incredibly diverse country. My bachans’ stories are as inspiring to young people as their ancestors’ stories are inspiring to me. … and to draw strength from the stories we celebrate here today. For me personally, the story of my maternal bachan, Konoye Hirota, never fails to fill me with hope … with perseverance …with admiration, with gratitude and with fortitude. Last fall, when my husband, Patrick, and I had to run for our lives in the North Bay fires, we lost our home and all of our possessions, we were minutes from losing our lives…..even then, I still took strength from my bachan’s story. The hardest, saddest part of losing all of my things…was losing my Japanese things. It felt like losing my past and my connections to my parents and grandparents. My grandma’s teapot, the Imari plates, the Kokeshi dolls, my mother’s kimono, the kabuto or samurai helmet that my grandfather gave to my sons…and losing all of my family’s history through artifacts from Tanforan, Topaz and Tule Lake. She was the younger sister who went to the boat dock to say goodbye to her older sister, o-ne-san who was about to sail for America as a picture bride. But on the dock, her older sister grew afraid. My bachan’s older sister, her ne-san, decided just as the boat was about to leave the dock….that she could not go to a country where she knew no one, and where she did not speak the language. So the older sister urged her brave younger sister … my bachan … to go in her place. My bachan was dutiful and did as she was asked. She took her older sister’s suitcase … full of clothes that were not her own … and boarded the ship bound for San Francisco…clutching the picture of her husband-to-be, my ji-chan, grandpa. Masajiro Hirota. To this day, I draw strength from the courage and optimism my bachan always kept alive. … my bachan stayed strong. She knew nothing about the country where she would live. She knew nothing about the man she would marry. She spoke no English … and she knew no other Japanese people in her new home. Her heart was always filled with gratitude. In her new home, with her new husband, she raised five children. 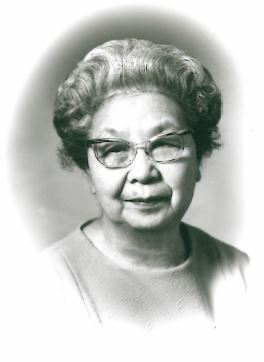 In the war years, in the internment camp, facing racism and discrimination, she stayed positive … she stayed strong. My bachan is my hero. And that is also why I believe we share a responsibility to tell our family stories. … or in our local communities. Young people are hungry for stories that will give them strength in challenging times. And young Americans … of all backgrounds … can learn from the incredible stories our Japanese American community has to share. It’s in this spirit that next spring, 23 Sonoma State students will travel to Japan as part of the Kakehashi Inouye Program. This is an exchange program run by the U.S.-Japan Council. As part of this exchange, 23 students from Japan are visiting our campus, Sonoma State, this fall. The program shares the name of the late Senator Daniel K. Inouye. This is because the program honors his legacy … and also ensures that the students will learn about his experiences as a Nisei growing up in Hawaii, and serving his country in the military and in government. As I have learned and discovered in my own life, what it means to be Japanese American, it changes with each new generation. Here with me today is my oldest son, Dr. Dennis Masao Sakaki Wong … a Yonsei … and my granddaughter, Lana, who is half Vietnamese-American, one quarter Chinese-American and one quarter Japanese-American. My granddaughter’s middle name is Masako. She was named after my mother, her great grandmother. … my granddaughter carries our family story onward, into a new generation. She will decide what it means to be Japanese-American for her, as she grows. Stories … celebrations … get-togethers. … and through the years in the internment camps. We are all here today because of the strength … the perseverance … and the optimism of the family members who walked here before us. We carry their gaman and gambatte spirit. We are all here today because of their courage … their hope … and their determination to live the lives that became the stories we celebrate today. My heart is filled with gratitude for all who came here….to Angel Island. Judy Sakaki is president of Sonoma State University. 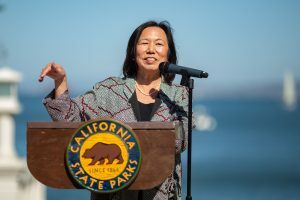 After a distinguished career in the University of California and California State University systems, she became the first Japanese American woman in the nation to lead a four-year university or college on July 1, 2016. 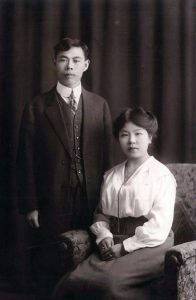 In 2009, Dr. Sakaki co-chaired a system-wide faculty and administrative task force to award honorary degrees to approximately 700 Japanese American University of California students who were unable to complete their degree due to their internment during World War II.